Spurs will be out for revenge as they travel to the Emirates Stadium for the second time in seventeen days to take on Arsenal in the quarter-finals of the Carabao Cup. Mauricio Pochettino’s team are still in contention in all four competitions this season and although the Carabao Cup is not the priority, beating Arsenal at their home ground certainly will be. After their victory over Burnley at the weekend, Spurs are five points ahead of their rivals in the Premier League table but will know that they need to put in a better performance than their last one at the Emirates. That defeat has been the only one in Spurs’ last eleven games and, unlike Arsenal, they’ve had to beat fellow Premier League opposition to get to this stage of the competition. Unai Emery’s side recorded a surprise away defeat against Southampton to leave them stranded from the top four. It was the first loss in 23 for the Gunners and showed that they have defensive frailties which Spurs will look to exploit on Wednesday. So far they have beaten Brentford and Blackpool at home in the competition so Spurs will offer the first real test in the Carabao Cup this season. Both teams have the challenge of putting out a strong squad against their bitter rivals but balancing that with their growing injury lists and festive fixture congestion. For Spurs, Juan Foyth is back in training and is in contention to play against Arsenal. It was only in the last round of the competition that the Argentine got his chance in the team versus West Ham and since then he has firmly been in Pochettino’s plans. Serge Aurier and Davinson Sanchez will both miss out but Pochettino is hopeful that Sanchez will be back by the weekend. Elsewhere Eric Dier, Jan Vertonghen, Serge Aurier, Mousa Dembele and Victor Wanyama will all be absent leaving Pochettino with limited options in the centre of defence and midfield. The Gunners have similar injury problems, particularly in defence, as Hector Bellerin was forced off at the weekend against Southampton. He joins Rob Holding on the injury table whereas Shkodran Mustafi and Sead Kolasinac are other defensive players that are highly doubtful to play against Spurs. Alex Lacazette, Aaron Ramsey and Mesut Ozil are all likely to come back into the team, as none started at the weekend, whereas Laurent Koscielny may be required again at centre back despite only recently returning from a long term injury. Mauricio Pochettino has confirmed that Paulo Gazzaniga will start in goal on Wednesday. The Argentine has emerged as Spurs’ second choice keeper behind Hugo Lloris and was the Spurs hero in the penalty shootout against Watford in the third round of the Carabao Cup. There are limited options in defence so Juan Foyth’s return is welcome and Toby Alderweireld may be required to start yet again alongside him. There could also be a debut for eighteen year old defender Timothy Eyoma if Foyth is not fit enough to start the match. 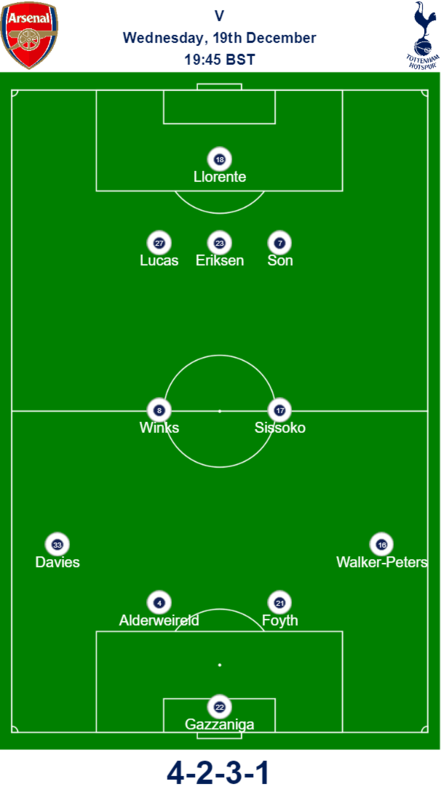 In the full back positions we expect Ben Davies to move over to left back after starting at centre back against Burnley and for Kyle Walker-Peters to come in for Kieran Trippier. Onto the midfield, Harry Winks will come back into the side and will likely partner Moussa Sissoko in the centre. Oliver Skipp could also be in contention to start and Mauricio Pochettino won’t be afraid of starting him in such a big match. In attacking midfield it is possible that Dele Alli could be rested because of the heavy fixture schedule. Christian Eriksen should return after coming off from the bench against Burnley, as should Heung-min Son, and Lucas Moura may start for the second match in a row after getting substituted after 65 minutes at the weekend. Pochettino has hinted that Harry Kane will play a part after not appearing for Spurs in the Carabao Cup so far this season but we think Fernando Llorente will be given the nod, with Kane appearing later on in the match off the bench. DERBY DAY IN THE CUP! “Football is emotion. In a derby, maybe this emotion is greater. I think showing our emotion, the players, the fans and me, is good. But every time we must respect them. When you win it’s amazing, when you lose it’s horrible. But respect is very important. Out of the Arsenal players that are likely to start, Alexandre Lacazette is potentially the most dangerous as Spurs found out a few weeks ago. The French forward has eight goals and 4 assists in all competitions so far this season, with only Pierre-Emerick Aubameyang (12) picking up more goals and Aaron Ramsey (6) having more assists than him. Jonathon Moss will referee both teams for the second time this season. Moss officiated Spurs in their 1-0 over Crystal Palace in November and Arsenal’s 2-0 home victory over Everton in late September. With both teams hit with a rather long injury list and rotation expected anyway in the Carabao Cup, we think it will be a tight encounter between Arsenal and Spurs in the Carabao Cup. Spurs will be looking to pick on a far from solid Arsenal defence though and the same can be said for their opponents with Spurs lacking in numbers there. This being the Carabao Cup a winner will be decided no matter what, with the match going to penalties if the scores are tied after ninety minutes. Our prediction is Arsenal 1-1 Spurs with Spurs to win on penalties.